Not to be confused with Egg Island. Eggland is the home of the Egglings in Yoshi Topsy-Turvy. 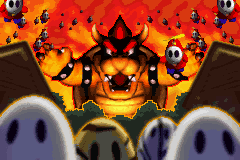 At the beginning of the game, Eggland is attacked by Bowser. The Egglings managed to escape to Yoshi Island, but before they could outrun Bowser, he transformed them into Apples. At the end of the game, Yoshi frees the Egglings from Bowser's curse and they all have a meal. As narrated, they will never forget Yoshi's deeds. This page was last edited on February 12, 2018, at 23:54.